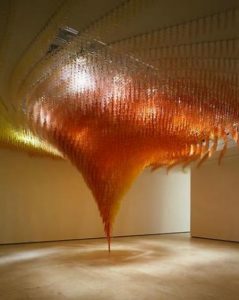 This work of art is a product of works on paper by Do Ho Suh, and was installed and presented by Lehmann Maupin Gallery in New York. According to Lehmann Maupin review, this is the fourth solo show by Suh at the gallery. Furthermore, this artwork metaphorically puts people within a complicated web of fate and destiny branching from strong idea that every human is spawned from the lives they may have lived formerly. There’s a vertical context of the figures that becomes an accumulation of ancient influences, and now begins to determine the quality of the inherent powers and strength that characterized a man. (“Lehmann Maupin”). “Do Ho Suh – Exhibitions – Lehmann Maupin.” Do Ho Suh – Exhibitions – Lehmann Maupin. Accessed April 05, 2016. http://www.lehmannmaupin.com/exhibitions/2007-11-03_do-ho-suh.